Why Should Offices Have Carbon Monoxide Monitoring? 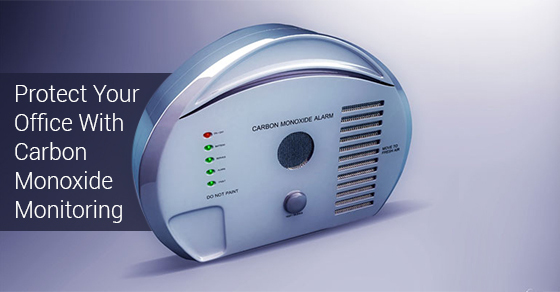 | Calgary Alarm Inc.
Why Should Offices Have Carbon Monoxide Monitoring? Carbon monoxide is a clear, odourless gas that, when we are exposed to it for extended periods of time, is capable of being quite lethal. Carbon monoxide is a byproduct of the process which creates heat. Since it neither smells, nor is visible, our senses are incapable of detecting it and we must rely on technology that is able to warn of us the—potentially life-threatening—danger. Below are some of the reasons why offices should have carbon monoxide monitoring. Early indication of fire. Because carbon monoxide is a byproduct of the heat created by fire, a carbon monoxide notification can act as a great early warning signs that a fire may be growing somewhere in the office. This can give you more time to react to both the fire and implement exit strategies for your employees, mitigating potential tragedies. Notification before levels are lethal. A carbon monoxide detector will monitor levels of carbon monoxide over time, letting you know of any anomalies or abnormalities well before CO levels become dangerously high. This will allow you valuable time to react and address the problem before it becomes a major health concern. The only form of defence against carbon monoxide. As mentioned, carbon monoxide is not detectable. You usually can only tell that you have experienced, or are soon to experience potentially fatal carbon monoxide poisoning, once the symptoms are present. These include nausea, blurry vision, dizziness, vomiting and disorientation. Insurance benefits. Having a carbon monoxide detector installed, especially as an early warning system for a potential fire, can help reduce the amount paid in insurance premiums as you demonstrate a willingness to utilize everything available to you in order to mitigate the risk of damage to the premises and put the health and safety of your employees at the top of the list of proprietary concerns. Show employees that you care about their health and safety. Taking all of the preventative measures at your disposal will make employees feel that their health and safety is important to you. People don’t want to work for someone who will take liberties with their lives. A carbon monoxide detector, or several of them, should be essential for any office. Placing them near areas where heat and fire are most likely to occur, will help you preempt not only a fire-related disaster, but the emotional and physical turmoil that come with evacuating. Knowing that your detection equipment has given you plenty of notice to take action and safely exit from the premises is peace of mind well worth the investment.